Flooding in various parts of San Diego kept rescue crews busy Tuesday. City lifeguards were sent to an inundated area along Highland Valley Road near Lake Hodges to assist a motorist whole vehicle got stuck in the water around 4:45 a.m., San Diego Fire-Rescue Department spokeswoman Monica Munoz said. As they were clearing the scene, a second waterlogged vehicle was reported in the same area. But that driver was able to get to dry land without assistance, Munoz said. Lifeguards were sent back to the scene to rescue another motorist around 6:30 a.m. after a truck got stuck near the intersection of Highland Valley and Sycamore Creek roads. Munoz said none of the motorists involved in the incidents suffered any injuries. 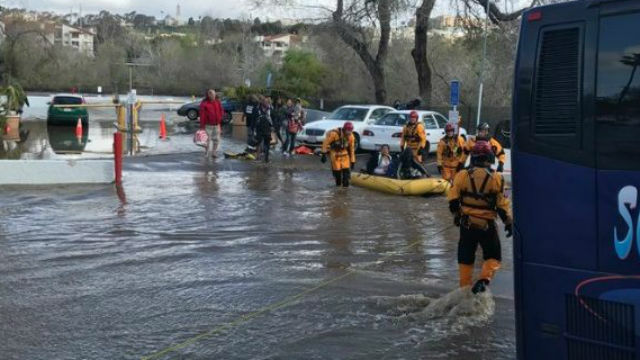 Rescue crews were also sent to the Premier Inns Mission Valley Hotel on Hotel Circle around 6:30 a.m. because about 20 hotel guests could not get out due to flooding in front of the business, 10News reported. Crews also rescued a fisherman seen holding onto a fence alongside Camino de la Reina to avoid being swept away by the storm-swollen San Diego River, according to NBC7.